Lewis Hamilton has clinched his fifth Formula One World Championship. The Mercedes driver wrapped up the world championship in the Mexican Grand Prix. Here, we look back at six key races in the battle for this year’s championship race. Sebastian Vettel’s championship challenge has been littered by errors, and he made his first of nine this year in the closing stages of a frantic Baku race. The Ferrari driver was running in second place before he attempted a gung-ho pass on Valtteri Bottas for the lead. His move backfired as he ran off the track and dropped two places to fourth. Hamilton, who had been off-colour for much of the weekend, then took the chequered flag after Bottas’ tyre exploded on the penultimate lap. Another mistake by Vettel cost the German further points at the Paul Ricard Circuit. As Hamilton galloped to a regulation victory from pole, Vettel collided with Bottas at the opening bend. The Ferrari driver, handed a five-second penalty by the stewards for his role in the coming together, damaged his front wing and had to stop for repairs before clawing his way back to fifth. Vettel’s demise, and Hamilton’s victory, enabled the Briton to reclaim the championship lead. Hamilton started 14th in Hockenheim after his Mercedes broke down in qualifying, while Vettel secured pole. Vettel appeared set to take victory only to crash out of the race following a late rain shower. To make matters worse for the Ferrari man, Hamilton benefited from the subsequent safety car to seal a remarkable victory. Afterwards, Hamilton’s former rival Nico Rosberg claimed it was the darkest day of Vettel’s career, and it was hard to disagree. Indeed, it could be argued that it was an incident from which he never recovered. He has never led the championship since. Monza’s ‘Temple of Speed’ became Ferrari’s ‘Temple of Doom’ after they fluffed their lines on home turf. Ferrari had the superior machinery, but it was Hamilton in his Mercedes who claimed one of the finest wins of his career. Vettel was last at the end of lap one after clumsily colliding with Hamilton. He recovered to finish fourth, but his team-mate Kimi Raikkonen was unable to stop the rampant Mercedes from passing him for the victory in the final stages of a stunning drive. Hamilton delivered the lap of his life to upset the odds and place his Mercedes on pole position. Hamilton should never have been in contention for the front slot at a venue which has proved a bogey track for the Silver Arrows in recent years, but not only did he take pole, but the size of his gap to the rest was mighty, too: more than six tenths faster than Vettel, and seven tenths ahead of team-mate Bottas. No wonder Hamilton described it as magic. Overtaking is impossible at the Marina Bay track, and Hamilton perfectly executed the win. Any slim chance Vettel had of stopping Hamilton taking the championship evaporated after his eighth and ninth mistakes of the year in Austin. First, Vettel was penalised three places on the grid after failing to slow adequately under red flags in practice. Then, in attempting to fight back through the pack, he tagged wheels with Daniel Ricciardo and spun. Despite a strategy error by Mercedes, Hamilton extended his championship lead, setting up his memorable Mexican night. Lewis Hamilton believes Ferrari are cracking under the pressure of this season’s championship fight after he took another major stride towards winning the world title. 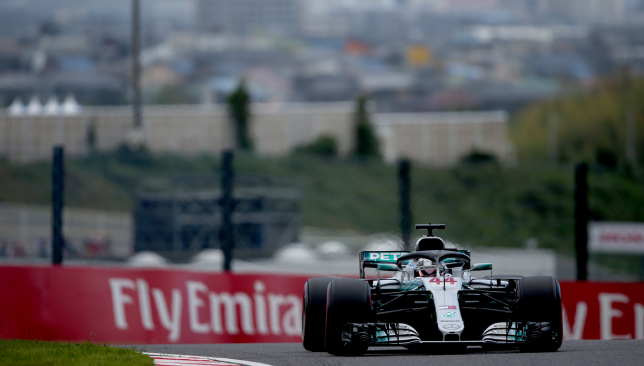 Hamilton will start the Japanese Grand Prix from the front of the grid after claiming an 80th pole position of his record-breaking career at the Suzuka circuit on Saturday. Sebastian Vettel, who is already a distant 50 championship points behind Hamilton, lines up only ninth after an embarrassing tyre blunder by Ferrari cost the German dearly in qualifying. It did not help that Vettel was also culpable of another error as, in attempting to make amends for his team’s mistake, he ran off the circuit at Spoon and finished 4.4 seconds down. His team-mate Kimi Raikkonen qualified fourth. Despite only a smattering of rain drops in the moments before the shootout for pole, Ferrari elected to put Vettel on wet tyres. Hamilton headed out on the slick rubber. While the Englishman posted the pole lap, Vettel had to dash back to the pits for a change of tyres. By the time he was ready to set his best effort, a rain shower left him terribly exposed. The track became increasingly damp, and there would be no challenge to Hamilton who, barring a disaster, will now extend his title lead and further tighten his grip on championship number five. “Every team has smart people, but ultimately when it comes to being under pressure and making the right decisions and the right calls, that is why we are the best in the world,” a delighted Hamilton said. “It adds to the momentum of this championship. It is always difficult to make the right call, but that is another real big difference that we as a team have made this year. Hamilton was not alone. Vettel was already on the radio even before he left the pits to tell his team they had messed up. It was too late. 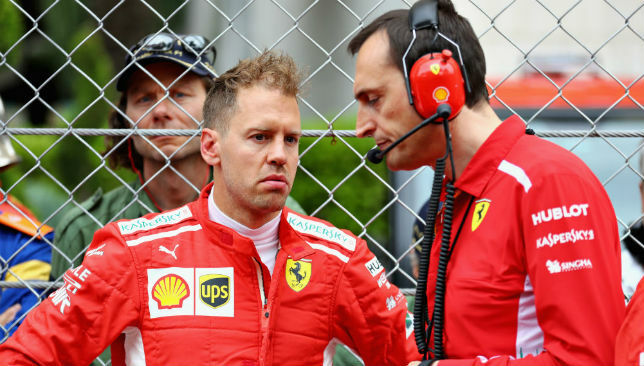 Vettel’s ensuing mistake also supports one paddock theory that his error-prone campaign has been sparked by trying to manage his hapless Italian team from inside the Ferrari cockpit. On Saturday night, the 31-year-old German toed the party line, but he will know that this latest setback is likely to mean the end of his championship challenge. “We expected more rain, and it didn’t come straightaway so it was the wrong decision,” he said. “I am not blaming anybody. It doesn’t matter who made the call. Why does it matter? It was our call. The best Vettel can realistically hope for in Japan on Sunday is fourth and if, as expected, Hamilton takes the chequered flag, the British driver will move 63 points clear with 100 on the table. It means the championship could be decided as early as the United States Grand Prix in a fortnight’s time. “It has been an incredible year, but never in a million years did I think I would get to 80,” said Hamilton, now 12 poles ahead of any other driver in the sport’s history. “Eighty is not the end, but it is a milestone I am very proud of. Lewis Hamilton has fired a warning to rival Sebastian Vettel by revealing he enters the final stretch of their championship battle in the strongest mindset of his career. Hamilton is 40 points clear of the Ferrari driver ahead of Sunday’s Russian Grand Prix, which plays host to the opening round of four races inside just five weeks. The British world champion, 33, has been in the form of his life in recent times with a scintillating win on Ferrari’s home turf at Monza followed by an against-all-odds pole lap in Singapore and a commanding victory. 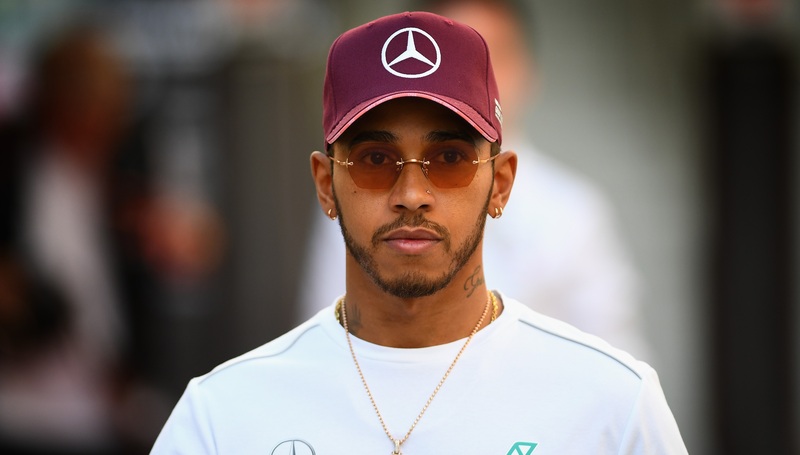 Hamilton has not returned to Europe since his triumph at the Marina Bay Circuit following work commitments in Thailand, Borneo and Malaysia, and a break in Dubai with American rap star Nicki Minaj. Both Hamilton and Minaj, who the Brit teamed up with to help launch his Tommy Hilfiger fashion collection in New York earlier this month, posted pictures riding a sand buggy to their respective Instagram accounts. “I feel healthy, happier and stronger than ever,” Hamilton said. “It still feels like it has been a long year. “But I have had plenty of time to myself, and some really good quality time with family. I also got to see some beautiful places and get some good training in, too, so I do feel really good for this last stint. 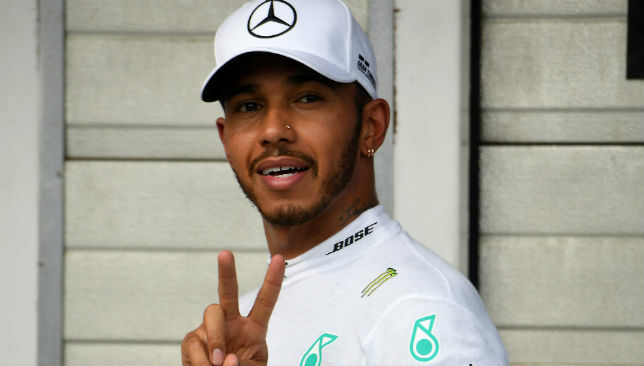 Hamilton’s back-to-back triumphs in Italy and Singapore means he arrives in Sochi having won four of the last five rounds to tighten his grip on a fifth world championship. But with 150 points still available, Vettel has not given up hope of beating the Mercedes driver to what would now rank as an unlikely title. “We have a fair chance,” he said. “Anything is possible. Vettel might take some encouragement from Hamilton’s troubles here last year. The British driver was mysteriously off-colour all weekend, qualifying only fourth – behind both Ferrari cars and his Mercedes team-mate Valtteri Bottas – before taking the chequered flag in the same position. Last year’s race in Russia was only the fourth of the year. Hamilton was still getting accustomed to his Mercedes machinery, and he believes the result is unrepresentative of what is to come this weekend. 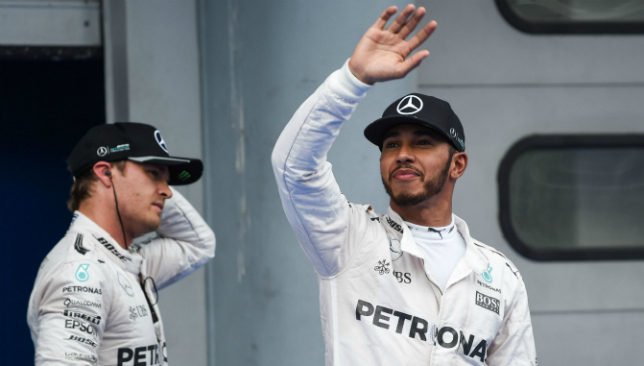 “I do believe we are in a better position than we were last season,” Hamilton added. “It is still a challenge to get right, but we will take our understanding of last year with a pinch of salt.